Small business owners frequently make decisions that are based on pure scepticism. They have lofty goals in mind, but they are not entirely sure that their decisions will achieve the desired outcomes. Investing in an answering service is one such decision that falls in this category, but it has consistently shown positive returns on investment. There are other reasons why entrepreneurs are hesitant to give control of their businesses to someone else: the Trust factor. A professional answering service, like other reputable businesses, will always do their best to represent your interests to satisfy both you and your clients. Here are four important reasons why you should invest in telephone answering services. It is more cost-effective to hire answering services than hiring an in-house receptionist. This saves you a lot of costs and allows you to invest the money in other areas of the business. Some of the costs you save by hiring an answering service include taxes, office space, and not having to pay NI, tax. Sickness, pension benefits etc. The only thing you’re paying for is the number of messages sent every month. This makes budgeting decisions easy, allowing you to invest in areas that will directly create more revenue. Answering services mostly hire trained professionals who have years of experience representing companies. They are able answer phone calls better than most receptionists . we are only as good as the service we provide so our receptionists must give exceptional service. 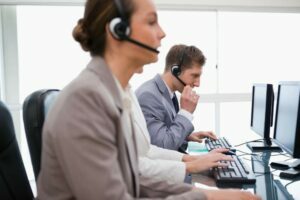 A single receptionist from an answering service is far more efficient than typical receptionists, and he/she can handle more calls while maintaining excellent consistent quality. The biggest advantage with answering services is that you’re not hiring a single person; you’re hiring a team dedicated to handle your calls. Once a client has called your business, the agent will immediately dispatch a message to a representative from your company to take the requisite action. This ability to seamlessly exchange information makes it easy to keep your business going and increase your sales. When you have a team of professionals handling your phone calls, it becomes easier to manage your time. Assigning tasks that are not directly related to your product or service to an answering service is incredibly efficient. It is a sure-fire way of improving your quality of service and ensuring that the customer keeps coming back. At the heart of any successful business is customer service. If your customers are unable to reach out to your representatives and get high-end customer service, it could be enough to turn them away from your business. Most professional telephone answering services employ unbiased and detailed strategies to ensure their agents are following a strict code of ethics. This guarantees a consistent and satisfactory service throughout their contract. Grow your business today with Telephone-Answering.biz. Click here for more information.